This interactive core logging software can be used on tablet devices in the lab itself enabling an efficient 'quick-start' routine core analysis experience. 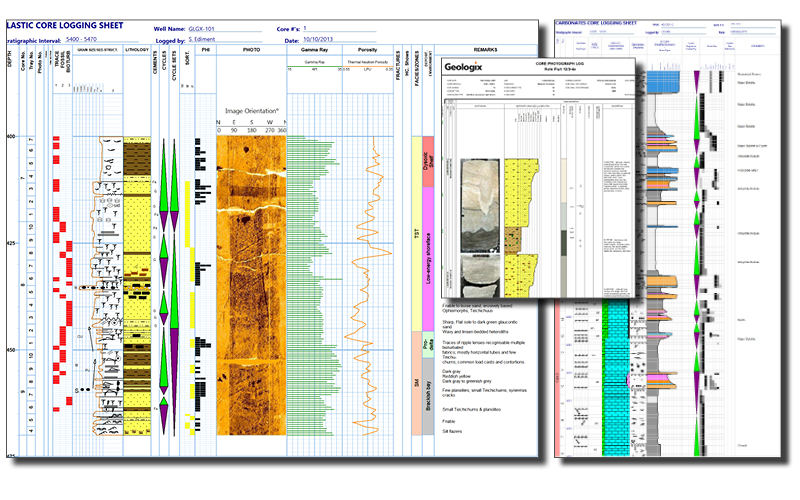 Core description logs created using GEOSUITE by Geologix. Image source: Geologix. Describing core to extract valuable hard data is key to the process of reliable reservoir characterisation, aiding field development and maximising recovery. Generating a digital interpretation of the core along with routine core analysis (RCA) data is not a new idea, since the data is always integrated and interpreted alongside other larger scale recordings from the well. If we assume the cut core quality is sufficiently good, and the interpretation quality is high, then the real prize is this information being delivered quickly to the reservoir team. What is new now is the utilisation of core log software on tablet devices in the lab itself, replacing the pencil and paper grid typically used. RCA data can be loaded immediately into the software at the correct measured depth, and the core description can take place, using a stylus. Standardised core log templates include a scaled grid structure and a comprehensive core library that drives an efficient ‘quick-start’ experience, and short-shifts the digital data creation. Once fully logged, all the data available in the application can be exported with one click and made immediately available to engineers waiting to add the latest data sets to calibrate a reservoir model. Sven Philit, Fabien Pauget, Sebastien Lacaze; Eliis, Caroline Guion; Eliis Inc.
To boldly go where no interpreter has gone before, getting one step closer to achieving the fully automated detection of faults in 3D seismic data.